Concentrations of trace elements (Fe, Mn, Cu, Pb, Ni, Cr, Cd, As, Co, and Se) have been studied in different trophic groups of organisms: primary producers (seston, presented mostly by phytoplankton), primary consumers (mesozooplankton, macrozooplankton, and bivalves), secondary consumers (predatory macrozooplankton and starfish), and consumers of higher trophic levels (fish species), inhabiting the coastal zone of Kandalaksha Bay and the White Sea (Cape Kartesh). The concentrations of elements differ significantly for the size groups of Sagitta elegans (zooplankton) and blue mussel Mytilus edulis, as well as for the bone and muscle tissues of studied fish species, Atlantic cod Gadus morhua marisalbi and Atlantic wolffish Anarhichas lupus. The concentrations of all the studied elements were lower among the primary consumers and producers, but increased again at higher trophic levels, from secondary consumers to tertiary consumers (“mesozooplankton → macrozooplankton Sagitta elegans” and “mussels → starfish”). Ni and Pb tended to decline through the food chains seston→…→cod and mesozooplankton→…→stickleback. Only the concentrations of Fe increased in all the trophic chains along with the increase of the trophic level. Original Russian Text © D.F. Budko, L.L. Demina, D.M. Martynova, O.M. 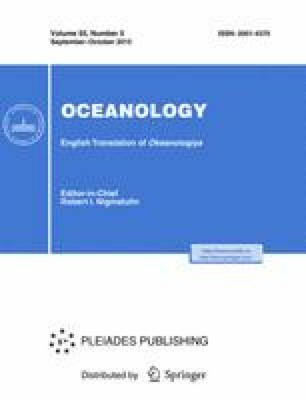 Gorshkova, 2015, published in Okeanologiya, 2015, Vol. 55, No. 5, pp. 808–820.